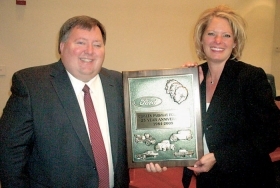 Steven Cowles of Cowles Parkway Ford in Woodbridge, Va., receives a 25-year award for Ford from Lisa O'Connor, Ford-Lincoln-Mercury's Washington regional parts, service and sales operations manager. 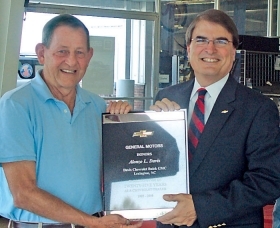 Lonnie Davis, left, of Davis Chevrolet-Buick-GMC in Lexington, N.C., receives a 25-year award for Chevrolet from Tom Saltarelli, Chevrolet's Southeast regional zone manager. Lonnie Davis is the dealer owner. Not pictured is Lee Davis, the dealer operator. 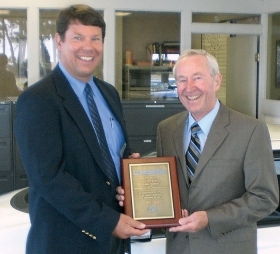 Dan Harper, right, of Mid-City Honda in Eureka, Calif., receives a 35-year award for Honda from Eric Van Olst, American Honda Motor Co.'s northern California zone sales manager. 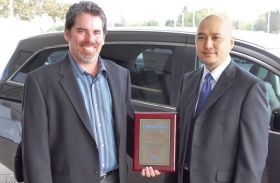 Art Mele, left, dealer principal of Yuba City Honda in Yuba City, Calif., received a 35-year award for Honda from American Honda Motor Co. At right is Mel Mascardo, the dealership's general manager.